Today’s lunchbox of Bahn Mi Lettuce Wraps, includes a wheat-free, slow roasted variation of Sam Sifton’s Vaguely Vietnamese Slow Cooker Pork Tacos. Sifton’s recipe calls for hoisin sauce, which contains wheat, so we substituted tamari (gluten free soy sauce), brown sugar, and some fruit preserves. Since we don’t have a slow cooker, I also modifed the preparation for slow roasting in the oven. 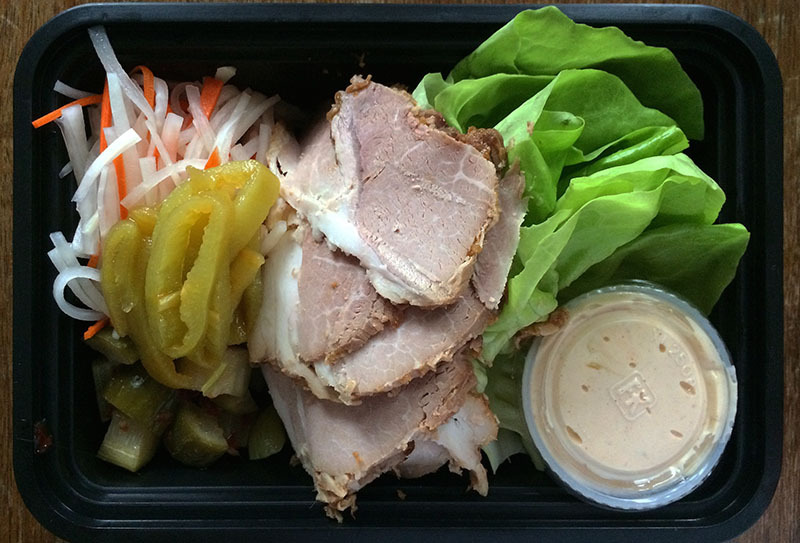 After the pork cooled overnight, we sliced it really thin and filled our lunch box with garnishes of bibb lettuce leaves, pork and duck liver pate, homemade quick pickles, and chili-lime mayo. 3-4 lb. boneless pork shoulder, skin removed, but with a little fat left on. Combine all the ingredients except the pork in a food processor or blender. Puree to make a coarse marinade. 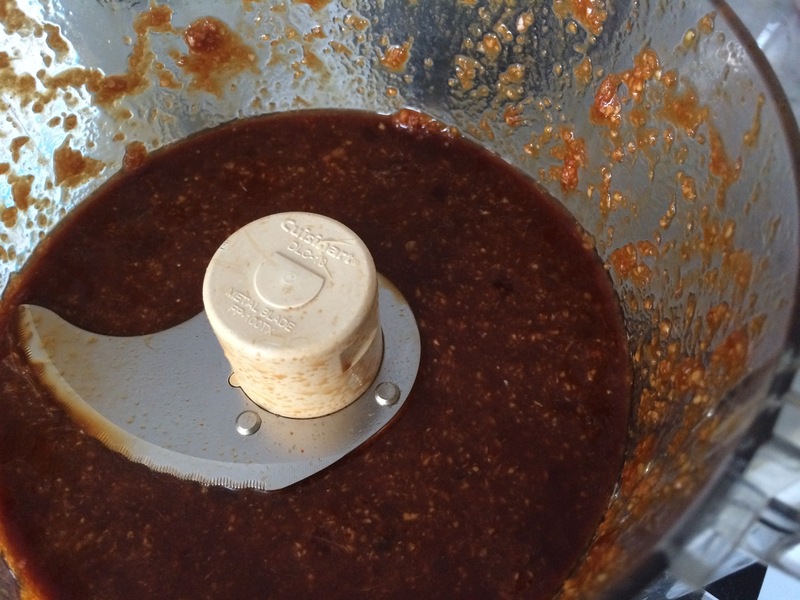 Place pork in the freezer bag and pour the marinade over it. Turn the pork to evenly coat it. Seal the bag, pressing out as much air as possible. Marinate, refrigerated, for at least 6 hours, and up to 24 hours. Preheat oven to 275 degrees F. Place pork in a 5-quart dutch oven or baking dish, with the fat side up. Pour the liquid from the bag over the pork. Cover the dutch oven with the lid, or if using a baking dish, cover the pork with a piece of parchment or wax paper, then cover tightly with aluminum foil. Roast the pork in the middle of the oven until internal temperature reaches 190 degrees F. It should be tender and beginning to pull apart. This could take anywhere from 4 to 8 hours. Check in periodically to make sure there is some liquid in the bottom of the pan and the bottom of the pork is not drying out. 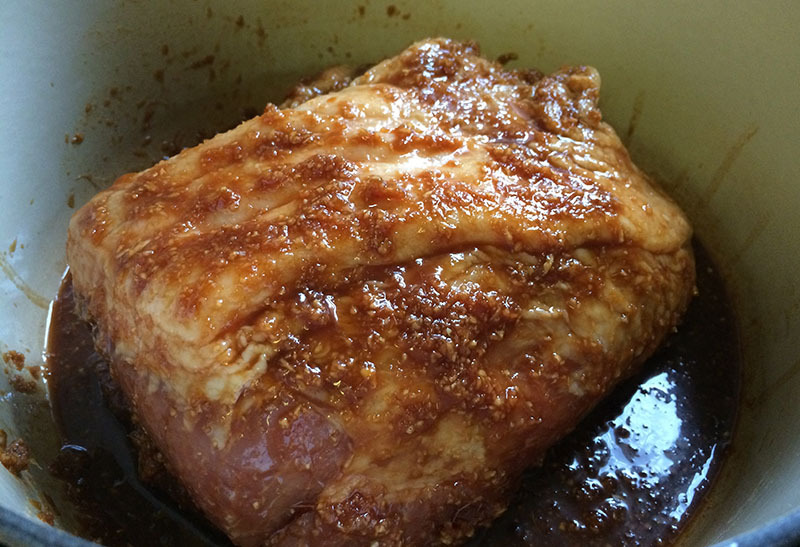 Rest the cooked pork in its juices, at room temperature for 30 minutes. Pull apart, mix with some of the pan juices, and serve hot, or let cool completely and slice and serve cold. It’s delicious either way. Tags: Asian, Gluten Free, Low Carb, pickles, pork, Slow Cooking. Bookmark the permalink.